I feel like sometimes one of the most neglected parts of blogs are the “About” page. We set it up but then leave it alone. We don’t tweak it and come back to it. We don’t utilize SEO for it. You guys I am here to tell you that my about page comes up in search for my blog ALL THE TIME! I want to tell you about 5 things you need in your about page so you can make sure you are utilizing every aspect of it! Your URL: You probably don’t think too much about your about page URL do you? It probably looks something like yourblog.com/about or yourblog.com/about-me. Am I right? If I am right, then that’s not the best way to go about it. In fact you should change it ASAP! My suggestion would be your city and niche you most commonly discuss. For instance yourblog.com/miami-fitness-blogger or yourblog.com/seattle-mom-blogger. Since I made this change to my about page 5 plus years ago, I am constantly at the top of search for Dallas Lifestyle Blogger and Dallas Beauty Blogger. Do you know how many times brands have told me that’s how they found my blog by searching for a Dallas lifestyle or beauty blogger? No one is searching for “about me”. Read more about that here. Your Email: Do you want people to find you? Do you think they should have to constantly be looking for your email? Yes you have a contact page and that’s awesome, but why does it hurt to have your email on your about page as well? My suggestion is to have your email several places throughout your blog. In my experience no one is going to search for it. Don’t make them have to. Is your about page as good as it should be? Your Current Life: Did you write your about page when you first started blogging and since then 3 years have passed and you haven’t touched it? Mistake. You should be updating it several times a year. I like to say once a quarter at least. I’m not talking about a complete rewrite but did you make a big move? Or career change? Did you have a baby? Get married? Make sure those things are updated at least briefly. For instance “We are welcoming a baby girl this summer!” Just one sentence can open up a ton of possibilities. You don’t need your entire life story in your about page but enough so that readers and brands can get a good idea of who you are all while staying current in your life. A Photo that represents you: It drives me crazy when I go to a blog and they have either 10 photos or a photo from 5 years ago. It doesn’t have to be professional but it should be current within the last 2-3 years. Again this is just my opinion and my experience. SEO: Your page should have GREAT SEO! This is where that city/niche URL tip comes around. I won’t lay out exactly how to do SEO right here (that needs it’s own post…or 12). But just make sure you are doing SEO for your about page just as you would for any blog post. It’s just as if not more important. Knowing which things you need in your about page can be tough. 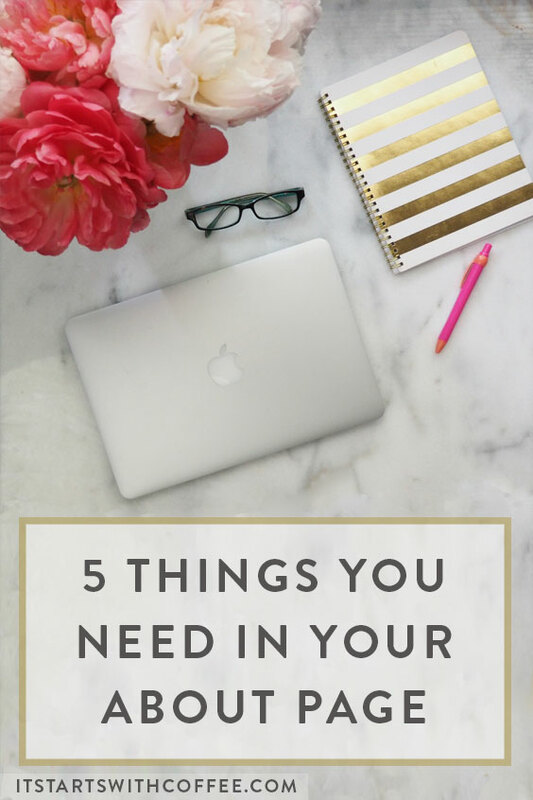 I hope learning about these 5 things you need in your about page was helpful! Okay, I wasn’t aware of the URL and SEO points. Thanks for the great tips, they were really helpful. I love the idea about changing your url on the about page. Will go and work on that one this week. Thanks for this great tip. I have mixed feelings about including the e-mail. I’m thinking to remove it from the contact page too, since the spam amount is getting bigger and bigger. I want to be contacted, not spammed. NEVER would have thought to change the URL to my “about” page! Thanks so much! I had not even considered the URL! I will definitely change that. I just updated mine for the first time in 2 years bc baby 3 was born. Love these tips especially about updating it frequently. Which reminds me It might be time for me to make some updates to mine as well! Love these tips! I never would have thought about changing the URL like that! Great tips. Awesome post – it’s making me rethink my About Me page. I’m adding an About Me audit to my to do list now! Great tips! I also hate when I go to an about me page and the photos are so dated!! I might be guilty of having older ones, but not like 4 years ago!! Exceelent tips! I’m changing my URL today! Some good tips here – thanks for sharing. I’m working on my About page revamp so this is very timely. I’ve been struggling to come up with a decent About page, so thank you for these helpful tips. I look forward to implementing some of these into my own page. You just reminded me that my About Me page is in DESPERATE need of a reboot. Thanks! Oh my gosh, what a great idea for the About page URL. I’ve never thought about that. I’m going to have to fix that tonight! Fantastic tips! It’s way too easy to create an about page and then forget about it. This is something I definitely need to work on with my blog. I know an About Me page is so important but i’ve overlooked mine for so long. Now it’s time to make this a priority though so i’m going to pin this as a great reference guide. Thank you for sharing it. Great tips! I need a new photo for mine! OMG great tips!! I agree – it drives me nuts when there isn’t an updated photo! I’m totally going to change my URL now! This is a great list. I have most of what you listed, on my blog but it’s great to know. Good pointers! I will for sure be taking these in to consideration! Great post! For someone new to the blogging world it’s nice to get tips like this! Great advice! Never new some of this and this will help me to improve and make sure my About page is up to date. Thanks for the tips!! I think it’s possible you could have prefaced this post with Dear Jessica! lol I am super guilty of ignoring my About Me page and can definitely make all of the improvements you suggest. They are all relatively easy fixes/updates and I need to make them a priority. I agree too, each quarter is a good idea! My first about page was HORRIBLE when I started my blog, but I’ve made tweaks since then. I think I need to do a complete overhaul though since I am approaching my first year in business and blogging! I will keep these tips in mind! I am definitely changing my About Page URL. I focus so much on content that I often neglect one of the only pages where people can learn about who I am. Great post! These are fantastic tips, Neely! My about page is definitely in need of an upgrade! These are great points! If you can start out a new blog with these things you’ll really give yourself an early advantage. I wish I would have known about SEO earlier in my blogging career. Great tips! I’m totally guilty of ignoring my About Me page. I’m thinking of switching over to WordPress soon and getting my own domain name, so I need to work on something new for when that goes live! Thanks for this post-I just went and updated my about me because of this! I would love more posts about SEO, I’m so curious but yet overwhelmed by it as well! I know there are probably tons of other blogs that talk about it, but you just have a great way of explaining things that makes it uncomplicated for me! This is really great! I have been needing to redo my about page and this is perfect! Yeah I paid zero attention to SEO on my about page. Have to fix that ASAP. Thank you so much for sharing these tips! I made updates to my about page as I was reading through. It had never occurred to me to update the url and / or have easier ways for people to make contact. I also made a few updates SEO wise. I’ll be really keen to see how this affects our traffic! This is really awesome info!!! I need to update my about page for sure! Ahh thank you for this! I honestly haven’t thought much about my “about” page in years, now I need to update it! Great tips! Changing my URL as we speak. This is such an informative post! 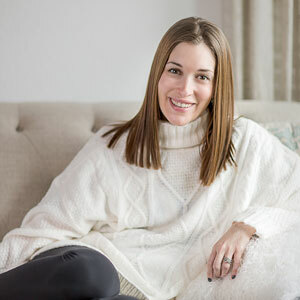 I’ve had some difficulty with my About Me page but I really like the tips you’ve given here and I’m going to try to apply them. Thanks for sharing your insight! I’m not sure if I have my url on my about page or not. I do have the other things after I recently updated it! Great tips, Neely! These are all so true. This was super helpful, thank you Neely! A photo that truly represents you is very important. I agree with you, many people ignore this valuable resource. I never thought about changing the URL, but it seems so obvious now that you’ve mentioned it! I actually just rewrote my blog bio today. It had been outdated for nearly a year. Thank you so much for sharing this! I just updated my About Page SEO (shame on me for not doing this previously!). Though I do have New Jersey lifestyle blogger in the URL, I didn’t update my YOAST SEO so the snippet describes my blog briefly. Invaluable advice, as always–and thanks so much for sharing! PS: As someone who is CONSTANTLY searching for ways of contacting bloggers, email is SO important! I never understand why bloggers would hide it, but it’s crucial for sponsored opps!! These are great tips! I think these tips work for all occasions. Prioritizing what’s important, asking for help, and finding time for yourself are a must! Thanks so much for all the tips I seriously wasn’t aware of any of this and honestly for a while I even forgot that I had wrote on, I checked it out after not looking at it since I started my blog and I realized how out of date the post was and how much tweeking and changing it needs, I am definetly implementing all these tips and putting this on top of my priorites to update and mange quarterly.